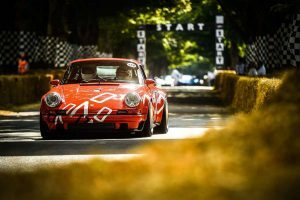 Porsche dominated proceedings at the 2018 Goodwood Festival of Speed as Lord March dedicated his annual motoring garden party to the seven decades of Stuttgart’s favourite sports car. In what was a special 25-year anniversary of the Festival of Speed itself, a scintillating weekend of action with Porsche right at the top of the billing began on the Wednesday night with the unveiling of artist Gerry Judah’s 52-metre sculpture taking pride of place out the front of Goodwood House. Featuring six icons from throughout the company’s rich history, the magnificent structure’s unveiling began four days of celebrations with an unprecedented presence of Porsche cars taking to the 1.16-mile hillclimb course, with further motoring icons on states display throughout the Goodwood estate. Highlights for Porsche fans included the dynamic debut of Andreas Preuninger’s Speedster concept up the hillclimb course on Friday, Saturday and Sunday, while this year’s Le Mans-winning ‘Pink Pig’ 991 RSR also took to the hill, still bearing the many hallmarks from its enduro at La Sarthe. Other racing greats from throughout the company’s history were on display, including the Porsche 919 e-hybrid in continuation of its ‘goodbye’ world tour. The Festival of Speed also gave a world debut to Singer Vehicle Design’s DLS project, the result of a new partnership with Williams Advanced Engineering, using expert consultancy from Norbert Singer and one Hans Mezger, to name but a few. Pictures courtesy of the talented Louis Ruff from Definitive Media.